Y'ALL. When Olivia Culpo goes after someone, she goes after them HARD. (And yes, I am partially referring to when she iconically posted "I hope you get spinach stuck in your teeth and no one tells you" on Tristan Thompson's Instagram after there were rumors of him cheating on Khloé Kardashian.) Olivia posted a picture to Instagram referring to her ex on his birthday, and let's just say that it does *not* seem like things ended well. However, People reports that Danny was seen canoodling with another woman last weekend—and that he and Olivia were not broken up at that point. So clearly, Olivia has reason to be salty, and her Instagram yesterday proved that she is 100 percent pissed about the situation. 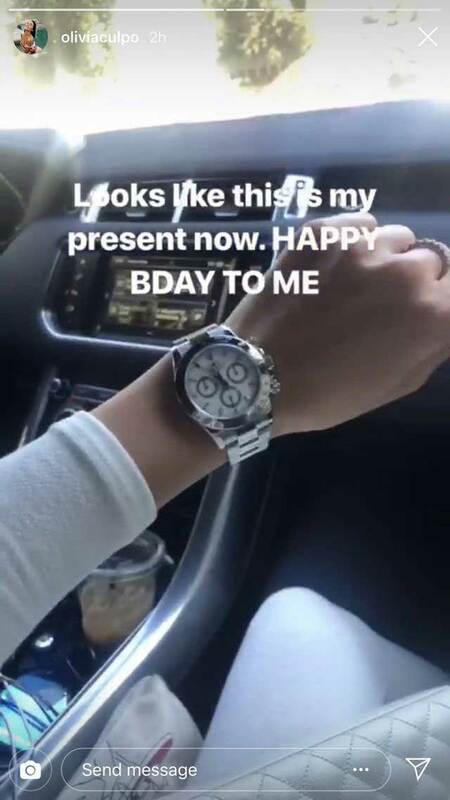 Yesterday was Danny's birthday, and Olivia decided to remind him of what he's missing out on by posting a photo of her wrist in a super pricey Rolex with the caption: "Looks like this is my present now. HAPPY BDAY TO ME." And even though this is a totally savage move, it's also a pretty convenient one—if your BF cheated wouldn't you want to a) withhold any gifts you got for them b) treat yourself/shop through the pain and c) remind them how good they had it? Olivia got all of that done in one swift move, and that's just some smart 'gramming.